In Swedish history, aquavit – in Latin, aqua vitae, means the water of life – is first referenced in an early 16th century letter. O.P. Anderson's Aquavit is the oldest aquavit of Sweden. Carl August Anderson launched it in 1891 in honor of his father, O.P. Anderson, who was a ship owner, proprietor of a liquor factory, and a member of the Göteborg City Council. For centuries, aquavit has been the quintessential spirit of celebration and song in Scandinavian culture. In Sweden, before drinking a small shot of aquavit (a snaps), tradition calls for a vigorous song that glorifies the delicacy of the drink (a snapsvisa). Drinking songs are short and easy to learn, aiming for everyone around the table to join in. Across Sweden, Norway and Finland as well as parts of Northern Europe, aquavit is the traditional spirit for festive gatherings, dinners, weddings and informal get-togethers. Like vodka, aquavit is a distilled liquor, but aquavit's distinctive aromas and seasonings come from a blend of herbal essences of fennel, caraway, and anise, which are the classic aquavit spices. O.P. Anderson Aquavit is made with Swedish (CK) wheat; in addition, the classic spices are stored in oak barrels for six months, which add tannins and oak flavorings. At 40% alcohol, O.P. Anderson Aquavit is a versatile ingredient in new and classic cocktails. O.P. Anderson Aquavit is the best-selling brand in Sweden and, today, the world over, this iconic spirit is traditionally served as an aperitif, while mixologists and consumers are increasingly enjoying its herbal flavorings in all types of innovative drinks. O.P. Anderson Aquavit's label was inspirited by the mechanical industry of the late 1800's when the brand was first made by Olaf for Carl August, his father. Eminently versatile, O.P. Anderson Aquavit may be enjoyed neat and chilled, paired with smoked fish and other Nordic cuisine, as a savory alternative in classic cocktails such the Bloody Mary and Last World, or as a base for new drink creations. As Sweden's pioneering aquavit firm, O.P. 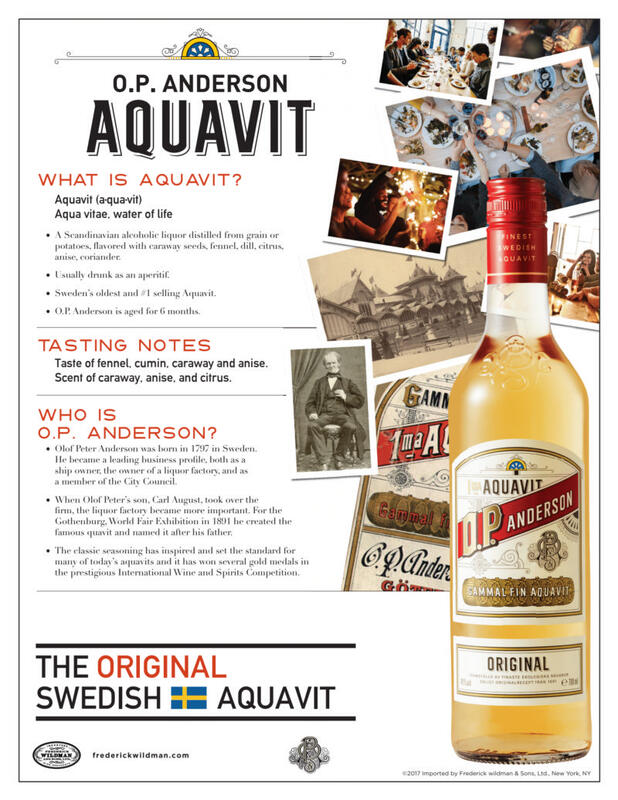 Anderson Aquavit established the standard for many of today's aquavits on the market. And thanks to the firm's exceptional quality standards, O.P. Anderson Aquavit has won numerous awards as well as several gold medals in the prestigious International Wine and Spirits Competition.